Byron Bay Market is a popular event in the area and is held on the first Sunday of every month. The market is one of the largest and most popular to be held in the region, with around 300 stalls spread over several acres selling an enormous variety of fresh produce, special hand-crafted items, exotic imports and take-away food. There is something for everyone including unique, high quality, jewellery, furniture, pottery, candles, skin care products, clothes, plants, garden furniture and sculptures. The Byron market is held on the Butler Street Reserve, entrance via the roundabout next to the railway line crossing at Shirley Street. Best to get here early if you want to get a park and have time to take it all in. Or better still park your car somewhere in town and walk across the railway line, either on the car crossing at the roundabout, or from the car park behind the Byron Visitor Centre. There is limited parking in Butler Street and Somerset Street, and it can get a bit busy. Have breakfast at the markets or maybe an early lunch and sample some of the many food stalls, the freshly squeezed Sugar Cane juice is especially good and save some room if you got a sweet tooth for fresh baked waffles and ice cream, some cinnamon churros or organic doughnuts!! 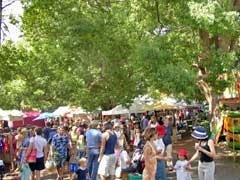 The market moves around every week with the Sunday markets being in Byron the 1st sunday of the month, The Channon on the second Sunday of the month and Bangalow on the 4th Sunday of the month. This particular market takes a break on the 3rd Sunday of the month. You don't see this every market day..